The head of the DApp architect extended warm welcome to all guests. Then from the macro perspective, he made an overall introduction to SilkAll. As world’s first open platform regarding the construction of international trade application, through tools and models covering Silk Token, Silk smart contract, Silk mining mechanism, and SilkCredit and through opening interfaces to our partners, SilkAll helps them get access to the SilkChain ecology without any trouble. Due to SilkAll, our partners can get more flow, users and gains, while the services they provide give our users richer experience, and all of this will make SilkChain more prosperous and ultimately achieve win-win situation for all parties. Different from the traditional “mining”, SilkAll takes the people as the start point and opens an era of “being active helps mining”. 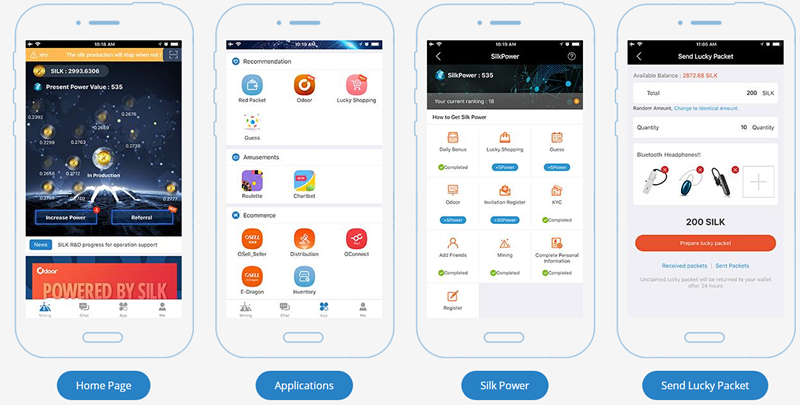 User can increase its power through active behaviors like sharing SilkAll, holding more Silk, promoting SilkAll, completing KYC verification, participating community activities, etc. And SilkAll will give Silk as award according to user’s power value. Thanks to the “being active helps mining” mechanism, users are much more willing to take part in and manage the community. What’s more, SilkChain project gains five-star rating from top rating agency IAP. As a well-known international rating agency, IAP established the vision of realizing the transparency, legality and fairness of ICO projects around the world at the very beginning. IAP cooperated with lawyers, blockchain association, industry experts and scholars to establish global transparency standards. IAP evaluates SilkChain from six aspects: team, project innovation, management, efficiency, risk and project sustainability. SilkAll has its own advantages in all aspects and has made tremendous contributions to the blockchain field. This quality design made by developer team built a foundation for the successful release of the whole platform.